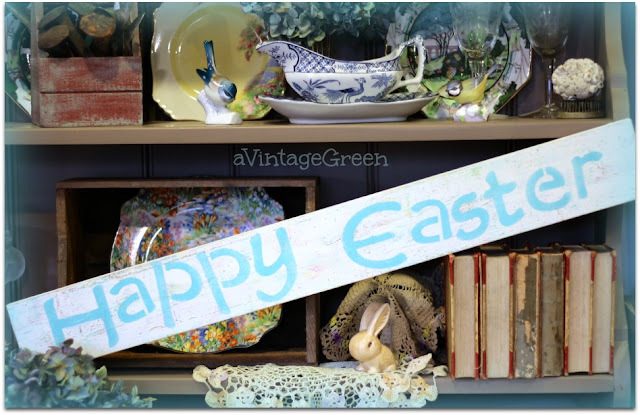 a Vintage Green: What Did I Do This Week? Stayed home this week and facilitated. It was time to upgrade the hot water heater and the furnace. Last week the Big Valley Plumbing and Heating Ltd. job manager and I walked through the 'job site' (basement) and went over the work I wanted done, he measured, asked relevant questions, used formulas and wrote the contract and emailed it, we added a few small changes, signed, and a week later the work is completed. Our upgrade project was done by three very hard working guys from Big Valley Plumbing and Heating Ltd. Two Journeymen and one Apprentice. The big boss even dropped by. Lots of chat and loud music, sheets of tin, tool bags and pink 220 wire. Big boxes. Rolls of wire, pipes, copper, plastic, supplies. 3 days. I'm exhausted. Regular life had to carry on around the upgrades. Homework, routines, meals, work, living. Stuff. Peaches loved the extra attention and unexpected freedom when the back gate was left open - she started out exploring but the guys all have dogs and called her back, yelled for me and that was the end of her freedom. By facilitating I mean I cleaned out/hauled all our stuff that was in the way and moved it all out to the carport and now have a to figure out where to store the stuff now. I cleared wide paths in the hall/work area so the equipment could be removed/brought in easily, moved furniture out of the way in advance of the next stage of work. The furnace room doors weren't put back when the work was finished so that's one job for me to do (with help). I picked up the little bits and pieces the guys didn't notice (black electrical tape bits, bits of copper wire, bits of cardboard and plastic, not much really), put the garden tools back. Still have to store the ladder somewhere else). They took away everything they removed and brought with them. They recycled all the removed parts. 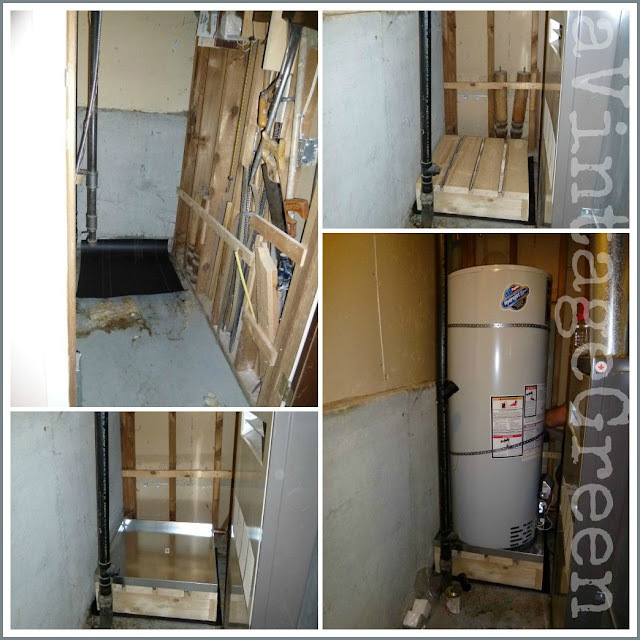 The removal and installation of a hot water tank (slow leak started the entire sequence) was the first job. The old tank went in in when we renovated the bathroom, about 12 years ago, so it didn't owe us any time at all. The new tank is now tied into the black drain pipe so that there will be no chance of water leaks. That work was done on June 1st. 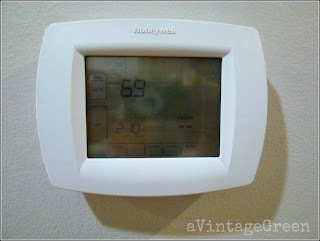 I do notice a positive change in the hot water - it doesn't take as long to go from cold to shower temperature. June 5 was the day for the removal and installation of the gas furnace. Last one was still working but at a much lower efficiency and it was 32 years old. 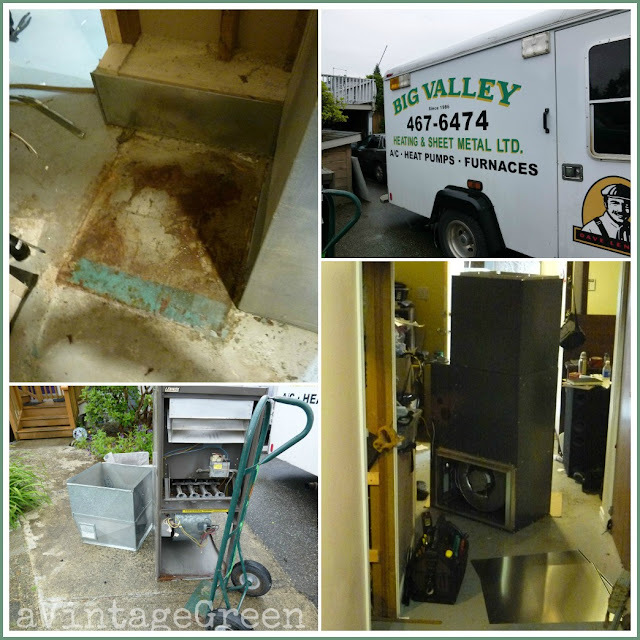 We've been discussing replacing the furnace for several years. Decided to 'bite the bullet' and get the work done this year. We put in a 95% efficiency furnace. 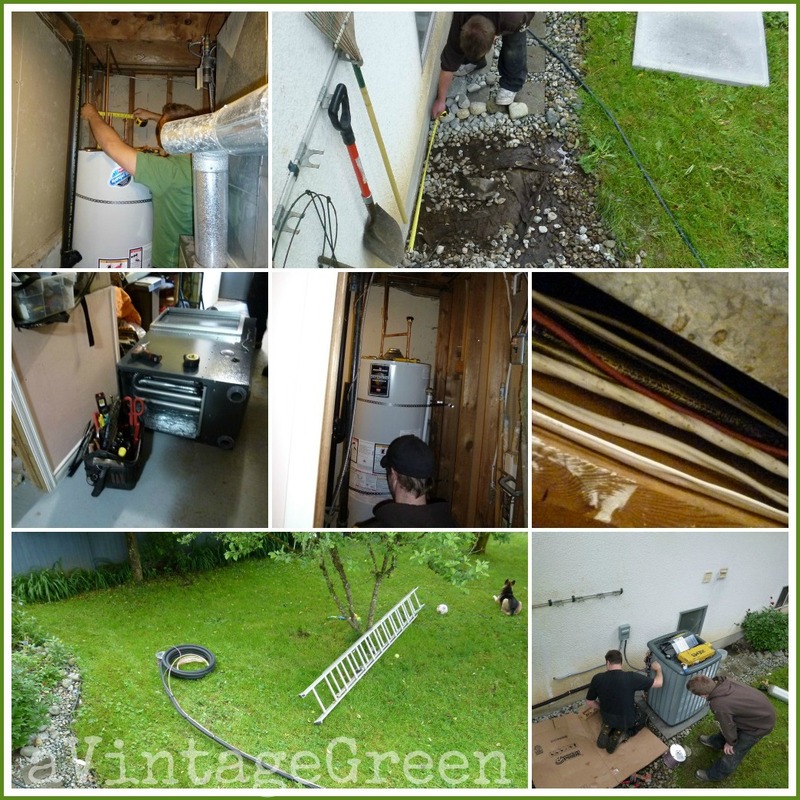 We made a decision to add a heat pump/air conditioner to our home this year. On June 6 the electrician arrived at 8:30 to get the pink 220 wire in place and add the green breakers to the electrical box. Since adding wire has been an ongoing upgrade around here I know WHERE the wire can be fished and where ceiling tiles have to be removed (facilitating). Now there are 3 more patch jobs to do. (wasn't expecting the workers until 10 am so glad I dropped DGS off at school a few minutes early so I was home when the electrician arrived). 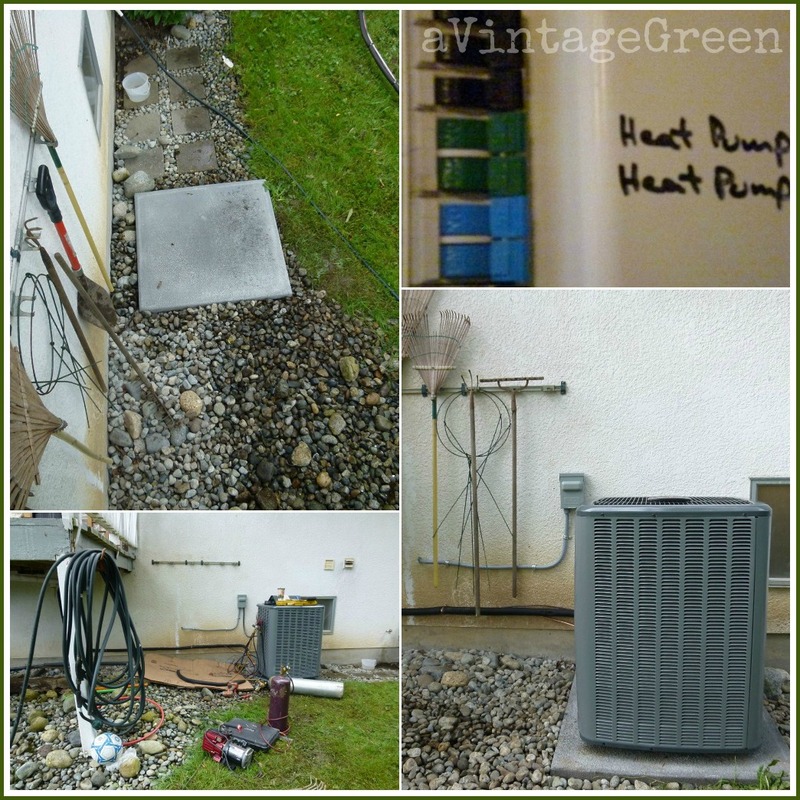 The apparent climate change (hotter summers) was our impetus to add a heat pump (heat/air) unit. We've been running 2 large portable air coolers and 8 fans in the house during the hot summer weeks and it hasn't been enough to make the temperature inside tolerable. Thats is also lot of stuff to store and move around twice a year. We are donating the air coolers and most of the fans after we have tried out the air conditioner (once we get some actual sun and hot weather). The base for the heat pump is a cement/foam/air composite, strong and light. Interesting. I like the addition of a green breakers with the addition of the words Heat Pump. Good idea which I will copy. (I did have a 'master' breaker list but it was on paper and after several years just 'disappeared'). I hope this is the end of the refits. Adding 220 wire in a finished basement is always challenging, as is adding wire up to the main floor for the new master controller (got a lesson on using it and have the manual - hope I don't have to change the settings, its hard wired so the batteries are just for backup in the small unit. One thing I like is that it shows the outside temperature. Touch screen. I had it set for celcius although this picture shows farenheit. We have some ceiling patching to do downstairs, plus a lot more sorting and deciding where to store things etc. in our near future. Maybe it is time to pay attention to my word of the year - Organization. Whoee! What a job! Thank goodness it doesn't happen every year! And on top of that you have to pay big money to go through all of that hassel! So glad it's over and you survived! LOL! on stuff that no one can see! Looks like you had a busy productive week. We just finished a complete kitchen makeover that took a long time to complete. 4 doors and 3 drawers to varithane and we are done. Too bad life isn't all fun and games, huh? But I bet you love hot water and warm air when you want it. Worthy pleasures worth investing in. And as one who had a water heater flood, I can tell you it is worth it to take care of it before the big event. Found your post at Share Your Cup. Oh, me too. I hate having to do the upkeep on non-pretty things, but it us necessary to be comfortable. Thank you for joining me at Home Sweet Home!